1. 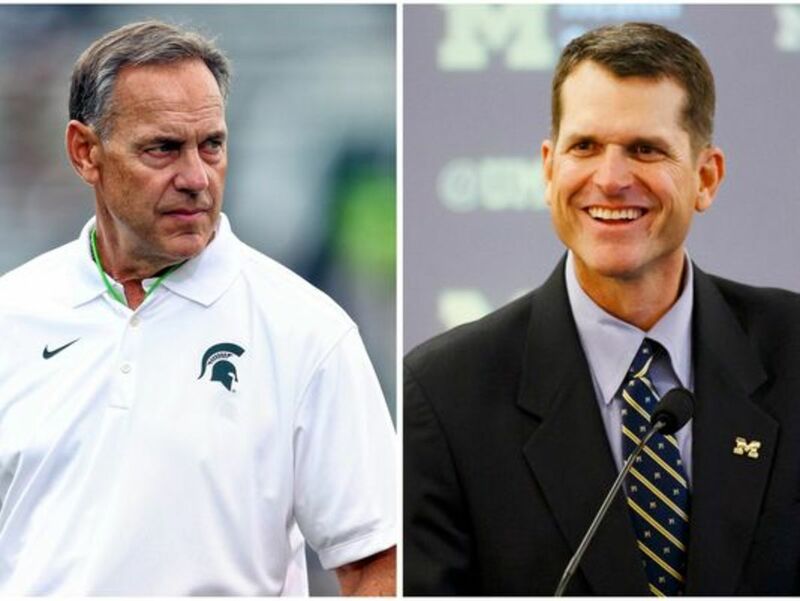 Mark Dantonio vs. Jim Harbaugh: HARBAUGH. DANTONIO. DANBAUGH. HARBONIO. Depending on whom you talk to, this is either the next game on the schedule or a battle for football soul of the state of Michigan. Reality, as always, lies somewhere in between. It’s safe to say Michigan State will puncture Michigan’s run of three consecutive shutouts, but it’s also safe to say Sparty will need to perform better than it has all season to emerge from the Big House with a win. After ranking 21st nationally in rushing last season, the 2015 Spartans are 67th – and that’s against a schedule that’s seen two defenses ranking 109th or worse and none in the top 25. Michigan ranks second. Quarterback Connor Cook is down from 19th nationally in passing efficiency to 27th, against defenses that rank 104th, 107th, 68th, 73rd, 78th and 97th against the pass. Michigan, again, ranks second. 2. Jake Spavital vs. Kirby Smart: Expect this game to much more like the 29-24 and 49-42 decisions of 2012 and ’13, not the 59-0 stomping of ’14. Of course, there’s the new defensive coordinator under Kevin Sumlin’s employ. The Aggies have also exchanged 16 starters from last year’s debacle, including at quarterback. And, most importantly, dynamic wide receiver/return man/spark plug Christian Kirk did not yet wear maroon in 2014. Both time the Aggies have been threatened this fall, against Arizona State in Houston and Arkansas in Dallas, it was the true freshman from the Phoenix area that bailed them out. He caught six passes for 106 yards against the Sun Devils, including a 79-yard punt return touchdown that gave the Aggies control of the game and a 66-yard touchdown catch-and-dash that put it away. Kirk burned Arkansas to the tune of eight grabs for 173 yards and two touchdowns, a 44-yarder that tied the game at 7-7 and a 20-yarder that put A&M on top in overtime, and added a 40-yard punt return. The more ways Spavital and special teams coordinator Jeff Banks can get Kirk the ball – in the screen game, in the return game, downfield, out of the backfield, on a cable descending out of the rafters – the better the chance A&M has of winning. 3. Clay Helton vs. Brian Kelly: Lying under the rubble of the Steve Sarkisian earthquake is a football team that’s has the potential to be pretty darn good. Only Baylor, TCU, Texas Tech and Western Kentucky average more yards per snap than USC. The Trojans get to go on the road, in perhaps the most well-timed road trip in college football history, against an opponent that will make every player instantly snap to attention. Oh, and they face a Notre Dame team that’s 2-6 the week after facing Navy, as the Irish did last week. What an opportunity for Helton here. 4. Jim McElwain vs. Kevin Steele: This was all set to be a showdown between Florida’s top 15 defense and an LSU offense that features the runaway Heisman favorite and a passing offense with five fewer completions of 10-plus yards than any other Power Five program. Then Florida quarterback Will Grier got suspended. Florida’s running game isn’t good (101st nationally), and now their passing game lies on the arm of limited sophomore Treon Harris. Turnovers will be paramount here. 5. Justin Fuente vs. Hugh Freeze: Memphis is on the verge of a top-25 ranking and claiming the driver’s seat in the hotly contest Group of Five bid to either the Peach or Fiesta bowls. All that’s required is a home win over a Power Five visitor ranked No. 13 in this week’s AP poll. Now consider that opponent is Ole Miss. There’s not a team on this planet Memphis fans would rather beat. The Tigers have beaten the Rebels only 10 times prior, and not since 2004. Put simply, win this one and they may kick Elvis out of Graceland and rename it Fuenteland.